I just found a link on the Destin Pelican Beach Resort management site for wallpaper for your desktop. The weather here in Tennessee is turning colder and what better way to bring back memories of your Destin beachfront vacation with one of these wallpapers on your desktop. I know many of my past renters read this blog and will want to grab one of these two beautiful pictures. There are several sizes available depending on your screen size. Here is a video I took 5 months ago after a recent upgrade of the nicest Destin Pelican Beach Resort beachfront condo #1004. 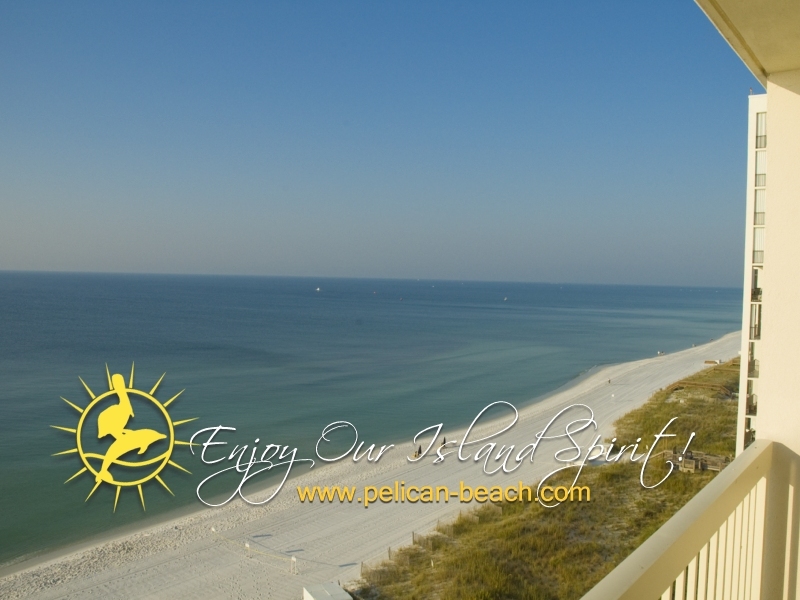 Today it is just beautiful at the Pelican Beach Resort Destin. My family and I got here Saturday afternoon and it has been sunny everyday with the exception of a storm front which came through at dark last night. I got up this morning to a bright sunny day with temperatures in the 70's. I went swimming on Monday and the water was cold at first but not bad at all once I got used to it. Today is our last full day at the resort and I am sure we are headed down to the beach after the movie "Gone with the Wind" goes off our tv. If you are looking to rent one of if not the nicest Destin Pelican Beach Resort condos for your vacation, check the calendar over on the left for availability then call or text Mike at 731-589-7841. My family and I are headed to the Destin Pelican Beach Resort this weekend for a short vacation. We will only be there a few days(my wife says not long enough) then back home and school for the kids. I am planning to return to the condo the second weekend in December to tile the master bedroom. If it is pretty my brother in law and I will fly down(3 hr flight) and if not we will drive(9 hr drive). That trip will be quick as it is just a working on condo trip. There are still a few empty spaces in December on my calendar over on the left so let me know if you want to sneak in a quick vacation. Looks like there is also 3 days and nights open the end of this month. I will still give you a Pelican Beach Resort discount even if it is short notice. My direct number is 731-589-7841. I was surfing online this morning and stopped in at the NWF daily newspaper and came across some pictures from the just completed Destin fishing rodeo that ran the entire month of October. Here is a link to one of the days catch complete with pictures. I hope you enjoy the slideshow as much as I did. I know the management team at the Destin Pelican Beach Resort is now gearing up for the arrival of the snowbirds in a few days. My snowbird does not check-in until January 1st so there is still time this year to book your vacation in the nicest beachfront condo in Destin in unit #1004. The availability calendar is over on the left or you can contact me at 731-589-7841. Last Thursday and Friday I received two calls wanting to book a vacation at my Destin Pelican Beach Resort condo. Fortunately these are for different dates. I gave both of the potential renters a great discounted rate and they both said "book it". Then on this past Saturday I got a call inquiring about renting the entire month of May but I had to tell her the entire month is not available. If you are planning your next vacation to Destin's Pelican Beach Resort, check out my availability calendar over on the left side then give me a call or text for the rate so you too can get booked into the #1 condo at the Destin Pelican Beach Resort. My cell number is 731-589-7841. I got a call earlier from a guy in Texas who told me he and his wife just love the Destin Pelican Beach Resort. Mark and his wife love the resort so much that they got married on the beach directly behind the Pelican Building. They have been returning to the Resorts of Pelican Beach every year for the last ten years. Mark said they lived in Birmingham but moved to Texas a couple of years ago but continue to make Destin and The Pelican Beach their vacation destination. I asked Mark why he called me to book his Destin beachfront condo vacation and he said that they always try to stay in the nicest condo there and my unit which he found on Florida VRBO is the nicest one they have found so they wanted to go ahead and book for May 2012. I told him how much I appreciate his compliment and promised him he would love unit #1004 and would not be disappointed. If you are looking for a beautiful beachfront condo to book for your Florida family vacation(one that won't break the bank) then check the calendar over on the left side and pick your dates and then call or text Mike at 731-589-7841. 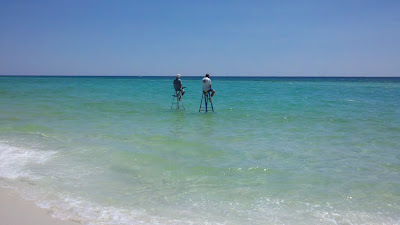 Destin hosts numerous special events and activities throughout the year. Many times, the Resorts of Pelican Beach will offer a special discount for visitors to many of Destin's best events! The 33rd Annual Destin Seafood Festival is going to set up along the length of Destin harbor from Harborwalk Village to the Boathouse Oyster Bar, including the Lucky Snapper Grill & Bar, Olin Marler Charter Boat Service, A.J. 's Seafood & Oyster Bar, Galati Yacht Sales, Dewey Destin's, the City of Destin Royal Melvin Heritage Park, Fisherman's Wharf, and East Pass Marina on Sept. 30 - Oct. 2, 2011. Each year the Florida State rally gets bigger and bigger. More HOG (Harley Owners Group) members are attending the Florida rallies due to the weather, location, meeting old friends and making new friends. From October 20-23, 2011, the Florida State H.O.G. Rally comes to Destin! Be sure to check my calendar for availability at the Pelican's #1 beachfront condo rental. Currently I have September 11-15 open in my Destin Pelican Beach Resort beachfront condo and I am offering more than a 25% discount for those 5 days. Check-in would be on Sunday the 11th and check-out would be Friday the 16th. The current rate being charged is $849.15 but with my discount figured in it would only be $657 total. This includes cleaning fees and taxes. Please call or text Mike at 731-589-7841 to take advantage of this great deal. A couple of years ago right after I purchased my unit at the Pelican Beach I noticed that there was WiFi in my unit. Actually I was picking up the WiFi at the front desk. A couple of months ago I could no longer pick up that signal. After consulting with Joan at the Pelican, I purchased a Linksys wireless router and had Thomas at the front desk install it in my unit #1004 Pelican Beach Resort Destin. There is WiFi again(at least in unit #1004). Now mom and the kids can all get on their Ipods,Ipads,netbooks and notebook computers without being wired up. We now have an available week in August at Pelican Beach Resort Destin. Actually it is the week my family had booked from August 6(Saturday) through August 13(Saturday). This is a 8 day period that is available. 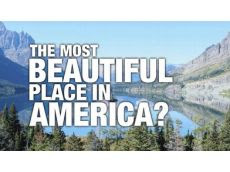 If you have been looking and looking and not finding, then I hope I have used the right keywords so you can find this ad. This cancellation in August at Pelican Beach Resort should be the right keywords. Contact Mike at 731-589-7841 for information and rates for your Destin beachfront condo vacation rental. Update: 7/21/2011 These dates have now been booked. 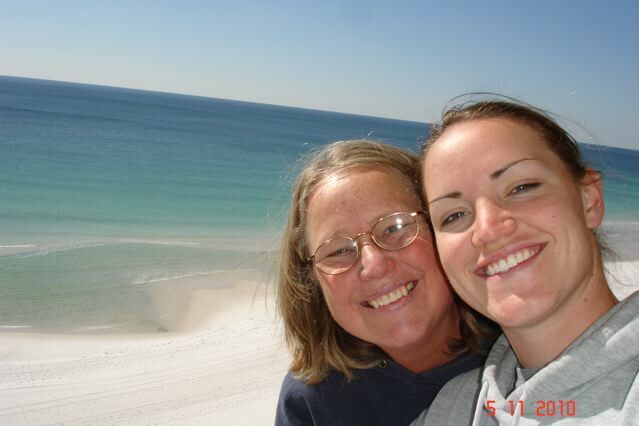 In October 2009 the Frazier family purchased our very own Destin Pelican Beach Resort condo. This Destin beachfront condo rental sleeps 6. On the day we closed on our unit, we walked out on the beach behind the Pelican and ran into 35 people(one of these families was booked in our new unit) from our hometown about 450 miles away. We considered that a "good sign". Not only has our family enjoyed the condo but we have continued upgrading it so others can enjoy it since it is on the rental program. There are pictures and videos over on the left that shows the renovations that we have completed and also an availability calendar in case you are wanting to book your Destin Florida beachfront vacation. Thanks to all my previous guests for booking with us and for helping us take care of this condo. I am sure the Frazier family will be down in Destin sometime during the month of October. Giggles The Clown will be appearing at the Pelican Beach Resort Destin on Monday, July 18th, Monday, July 25th and Monday, August 1st! 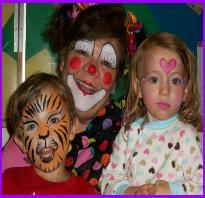 Giggles will be creating balloon magic and doing face paining from 4:15 - 5:15pm in Chan's Market Cafe. Chan’s will be offering $1.00 pizza by the slice and $1.00 snow cones during these times. I just read a news release that I wanted to share with all you anglers who like to travel to and vacation in Destin,Florida. On July 15-17, the Annual Big Mac Shoot Out Fishing Tournament will take place with cash prizes. This is to benefit the Ronald McDonald House. 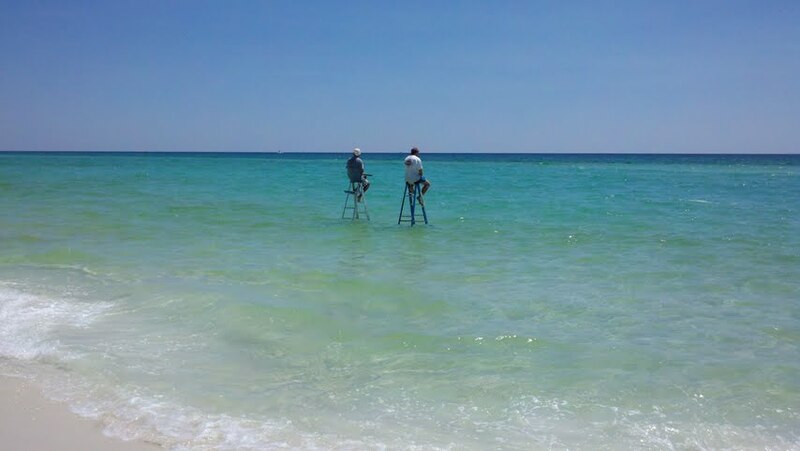 I am sure many out of town anglers will be or already have booked their stay in the Destin Pelican Beach Resort. FORT WALTON BEACH, Fla. (Feb. 11, 2011) – The first annual Big Mac Shoot Out Fishing Tournament benefitting the Ronald McDonald House of Northwest Florida will be hosted by the Fort Walton Beach Elk’s Lodge #1795, 1335 Miracle Strip Parkway, Fort Walton Beach, July 15-17, 2011. The boat fee is $200. Cash prizes totaling more than $10,000 will be awarded. The categories are as follows: Mackerel 1st, 2nd and 3rd, Wahoo 1st, Barracuda 1st and Redfish 1st and 2nd. Trophies will be awarded to all anglers 10 and under. Food and entertainment will also be provided at the tournament. A captain’s dinner will be held July 15 at the Elk’s Lodge, with final weigh-in on July 17. For more information on participation or to sponsor the event, call (850) 259-3790. When Is the Best Time to Vacation in Destin,Florida? My family and I all concur that the best time to vacation in Destin is in October. The daytime air temperature is still in the high 70's or low 80's and the water temperature is still warm enough to swim in. The crowds on the beaches are absent as is the high traffic count on US 98 through downtown Destin. We fly our small plane down to Destin,Florida and October has much more stable weather for our flights to and from Destin. The Pelican Beach Resort is only 1 mile from the airport fbo where we park the plane. The entire month of October is the fishing rodeo in Destin so a great time to go deep sea fishing and check in your catch at the harbor docks to see if you are the winner in your division. Last October I chose to do some shark fishing and caught a very nice one but did not boat him(released). October has some of the lowest rates of the season at Destin's Pelican Beach Resort. I often ask potentials renters of my condo why they do not wait until October to book their Fall Break vacation! If you want to rent one of the nicest beachfront condos in Destin at a discounted rate then contact me direct at 731-589-7841. For the last 2 months(spring and beginning of summer) the rental activity at Destin's Pelican Beach Resort has been brisk. Not only has my unit #1004 been fully booked but when I check availability in other units I often come up empty handed. Also over the last month I haven't booked a single vacation in my unit after the summer is over. I guess people are still concentrating on their summer vacation. My unit is fully booked until about August 11. After that there is availability right now. The decrease in activity in Destin beachfront condo rentals because of the oil spill is now behind us. The vacationers have returned in droves. It is also encouraging that oil and gas continues to come down in price so people can drive to their vacation destination. Another indication of better times in Destin is the fully booked flights into Fort Walton on Vision Airlines. I looked at several dates on their website but all were fully booked up. Did you know that the Destin Pelican Beach Resort has special accommodations for your company's or association's meeting/conference? My brother just returned from Destin and he attended the roofing convention at the Resorts of Pelican Beach. Here is a link to the Pelican Beach Resort information regarding rates and dates and amenities available for your next company meeting in Destin on the beach. In the link you will see the conference room that the homeowners association uses every October for their annual meeting. On my last trip to Destin I shot this new video of my unit #1004. This Destin Pelican Beach Resort condo has totally been remodelled including all new granite countertops and stainless steel appliances. 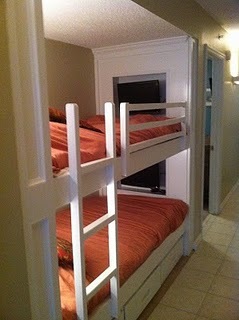 What motivates families to book my Pelican condo is the new hallway bunks with their own entertainment centers. Each child( or adult like me) can watch their own tv station or their own dvd video movie regardless what the other bunk is watching. We are booked up until August 11th but have availability after that. Call or text Mike at 731-589-7841 to discuss booking your next Florida vacation. I track the visitors to this site and want to share some statistics with you. 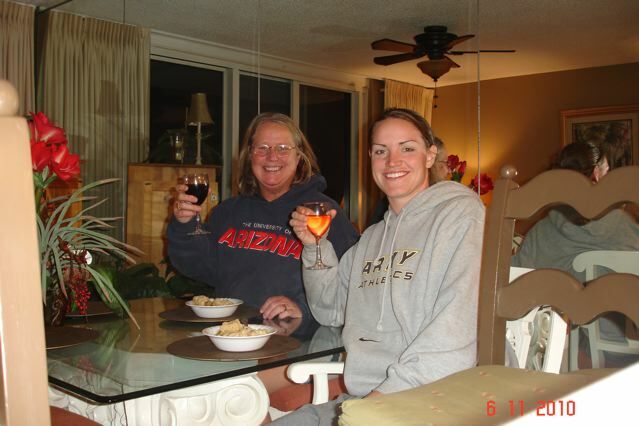 Over 9% of my visitors hit this site using the search terms Destin Florida condo rentals beachfront. Also, most of the visitors are searching online on Google, 3 to 1 over the closest search engine Bing. This morning I made it easier for smart phones to search on this website with a mobile platform just for smart phones. If you just arrived here and are looking for a good rental deal on Destin's nicest beachfront condo rental, contact me directly at 731-589-7841. Today is day 7 of our 8 day vacation at Destin's Pelican Beach Resort. In my last post I mentioned being at the Big Kahuna Waterpark across the street from the Pelican Beach Resort. We had so much fun there that we are going back again today. Yesterday we went to Navaare Beach to pick up shells and also swim a little. There is no lifeguard there so probable not a good thing to do. I am an excellent swimmer but we either saw a shark or Orca pass close by. Needless to say that was the end to my swim yesterday. I have never seen a shark at the beach behind the Pelican. The weather has been perfect here. When we left Tennessee tornadoes was the normal weather pattern(spring storms). We have had no rain or storms here. Last night we went to an Italian restaurant in Destin and it was the best italian food I have ever eaten. Our friends are locals and they love to eat at this place also. I will write a separate post about this restaurant later as I know you will want to go there and eat. Time to get ready for the waterpark. if you are planning a vacation to Destin Florida please consider staying at the Pelican Beach Resort Destin and if it is open unit #1004. I look forward to hearing from you. Mike 731-589-7841. It is not often that I have a cancellation but it just happened for a 7 day rental beginning May 14, 2011. Last night we had some pretty wicked weather come through west Tennessee and it hit the house of one of the renters slated to check in on those dates. Here is a great opportunity to grab a last minute reservation at the Destin Pelican Beach Resort. I will also advertise this on my Destin Florida VRBO site. Call or text me at 731-589-7841 and I will quote you a great rate and book you into a fantastic stay and the nicest resort in Destin,Florida. Update: Sorry, most of those dates now gone! I am sitting in the car blotting here while my wife is inside shopping at Bealls here in Destin. We also like to shop at Target and Marshalls. Tonight we plan to go out and eat. There are so many places to eat out here in Destin. My wife just came to the car so time to go. If you are looking for a great place to vacation where prices are reasonable then look no further that Destin and the Pelican Beach Resort. Call me direct to rent a great beachfront condo at 731-589-7841. My wife and I are like a couple of kids in a candy store. we are so excited that we are headed to the Destin Pelican Beach Resort. The last time I was there was about 5 weeks ago but I didn't have any R&R when I was there. 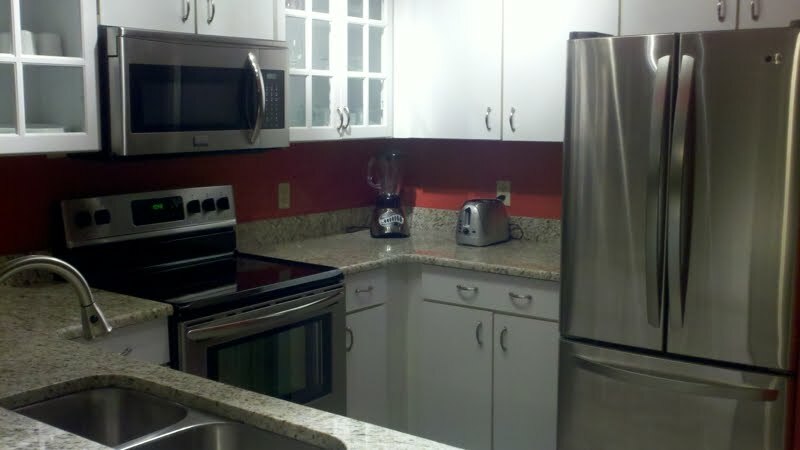 As you can see in an earlier post, I spent the entire trip remodeling the kitchen and making other upgrades. My wife hasn't seen the improvements first hand but she will this weekend. 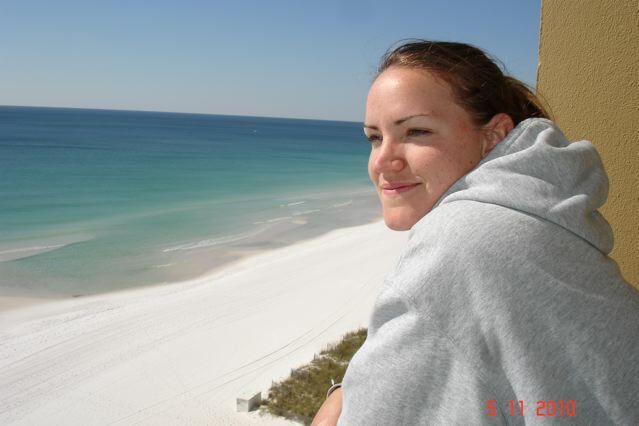 I plan to be just like any vacationer to Destin,Florida and enjoy my trip. Since the upgrades our calendar has been quickly filling up but we still have some openings for our beachfront condo rental in Destin. Call or text me at 731-589-7841 to book your vacation to paradise. I am starting to get multiple VRBO requests each day from vacationers trying to book their Destin Pelican Beach Resort vacation this year. With this being said, many of these requests coming in are for dates already taken. If you are planning a trip to Destin for vacation, do not wait before booking as the spring and summer slots are quickly filling up. My availability calendar is over on the left side so check for your dates. Call or text Mike Frazier(731-589-7841) to book your Destin beachfront condo rental. In case you missed the announcement, Vision Airlines began 737 jet service to Destin. Here is the announcement down below and the map of cities they service into Destin up above. New Service Begins in March! Special Fare Sale - $49*/each way, when booked now through 1/23/11! (01/18) - At a press event held today at the HarborWalk Village in Destin, officials with Vision Airlines announced new direct flights to the Emerald Coast starting in March with introductory fares as low as $49 each way. 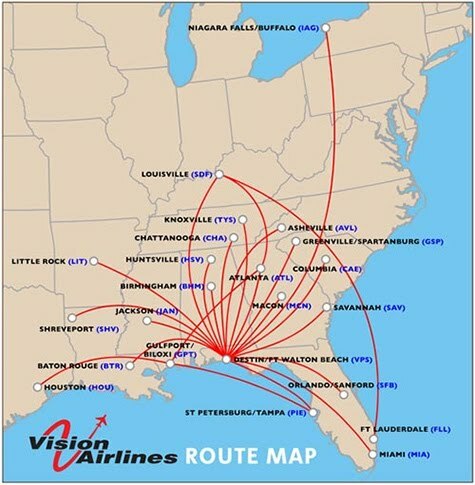 In December, Vision Airlines began its 737 jet service to Florida's Emerald Coast. As a result of incredibly positive results, Vision Airlines is expanding its routes to include over 20 U.S. cities beginning this March. That makes reaching our sugar-white sands and emerald-green waters easier than ever. With rates starting at just $49 each way, flying direct on Vision Airlines can be even more affordable than driving. 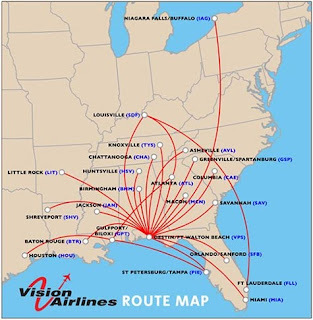 For more information on Vision Airlines' new routes and fares, visit www.visionairlines.com or call 877-FLY-A-JET. With discount airfare to Destin and a discounted beachfront condo rental in Destin, it doesn't get any better than this. Call or text Mike(731-589-7841) to book #1004 for your next emerald coast/Destin vacation. 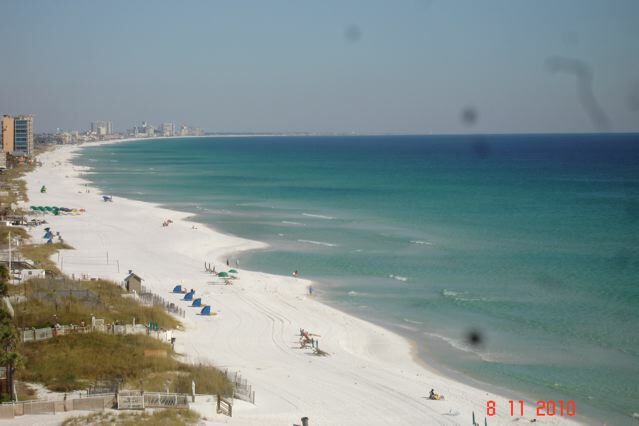 Where can you find the best condo rental deal on the beach in Destin,Florida? The best deal for the money is unit #1004 at Destin's Pelican Beach Resort. Many VRBO's are contacting me about renting my one bedroom(sleeps 6) beachfront condo in Destin. I give them a great price(cut the rate from 20-25%) and many times they tell me mine is not quite the cheapest rate but with the many amenities at the Pelican Beach Resort and inside my unit #1004 they are ready to book. What i think is really grabbing their attention is the new hallway bunks and each complete with its own tv/dvd combo units at the foot of the bed. Also, there is a recessed area(behind and slightly above pillow) with a light and plug-in(for kids cell phone or Ipod charging). These bunks also have a dimmer switch for the individual recessed lights. I did not leave dad out though. I have a new flat screen tv in the bedroom mounted on the wall(slight angle for dad laying in bed). Call or text me at 731-589-7841 and I can give you a great rate and a promise that you will have a fantastic time staying in my Destin beachfront condo. My February renter just canceled for my Destin Pelican Beach Resort unit #1004. Therefore I am prepared to offer a sweet deal for the month of February. Normal rate is $1300 plus $100 booking fee and 11% Florida tax for total of $1554.00. My Destin Pelican Beach Resort discounted February rate is $1150 plus applicable fees. My cell phone is 731-589-7841 so call or text me for more information. Update 1-12-11 February has been taken! Almost every Pelican Beach Resort VRBO inquiry I have received in the last few days has wanted to know if #1004 hallway bunk beds really have flat screen tv/dvd players? Back a few weeks ago, my brother-in-law and I completely rebuilt the hallway bunks and also installed new flat screen 19" tv/dvd players in each bunk. Not only that but there is a recessed area behind each pillow complete with plug in for electronics and recessed light w/dimmer switch. Did I go overboard or what? We also installed a new 26" flat screen tv on the wall in the bedroom.